This solemnity celebrates the bodily taking up of the Blessed Virgin Mary into heaven at the end of her earthly life. Dogmatically defined in 1950 by Pope Pius XII, accounts of the assumption of Mary into heaven survive in apocryphal narratives from the third and fourth centuries, and the feast was celebrated as early as the fifth century. 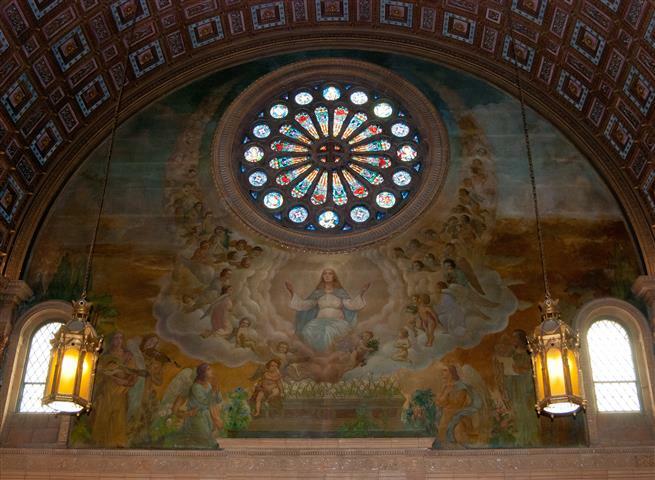 Painting of Mary’s Assumption by Joseph Mazur on left side of church transept. Feast of Assumption ~ This Tuesday, August 15, the Church celebrates the Assumption of the Blessed Virgin Mary. This solemnity, which is a Holy Day of Obligation, commemorates the bodily taking up of the Blessed Virgin Mary into heaven at the end of her earthly life. 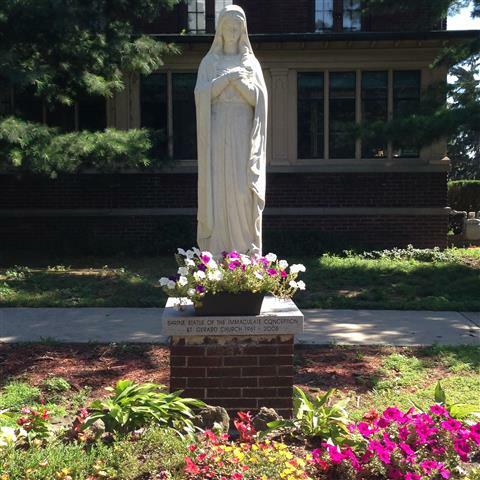 We will observe the feast with outdoor evening services near the Blessed Mother statue and shrine, beginning at 6:00pm with an Offering of Prayers and Petitions, followed by the presentation of individual flowers to the Blessed Virgin Mary. Mass will begin at 7:00pm. It is an opportunity to thank God for the many blessings we have received and pray for continuous blessings and protections. Please bring a flower to present and a folding chair to sit on. We pray for favorable weather. Stewardship calls us to realize that each of us is called to give as God has given to us. We no longer base our giving on what others are giving. We no longer excuse ourselves from giving because we do not see others giving. Rather we give in proportion to all that God has given to us. Guest Musician ~ We are grateful to Cory Gallagher who enhanced our liturgy with his musical talents this Sunday. Mr. Gallagher, who served as cantor and pianist, was filling in for our music director, Elizabeth Clay. Elizabeth is away on vacation and will return on August 20. Parish Council Elections are scheduled to take place on the weekend of September 9/10. The nominating committee is grateful to those parishioners who have agreed to stand for election. We will be announcing the slate of candidates at the end of August. August Mission Appeal ~ We join Rev. Ivan R. Trujillo in thanking you for your generosity directly benefiting the Guadalupe-Bolivian Mission in South America. Last week’s second collection in support this annual mission appeal was $394. Ordination Anniversary ~ Father Victor Ibhawa asks that we remember him in our prayers as he prepares to celebrate his seventh year as a priest on August 28. Honoring Father Roy Herberger ~ A very special part of the central city vicariate, Rev. Roy Herberger, is retiring at the end of this month after 49-years of active ministry. However, our friends at Ss. Columba-Brigid wanted to do something equally special to honor him on the occasion of his fiftieth anniversary, so they have planned a dinner for May 25, 2018, and they want all of us to be a part of their tribute. Please save the date. Having served in ten parishes and three correctional facilities, Father Roy looks forward to the celebration next Spring as a chance to reminisce and share stories with those he has been blessed to know. His final Masses and celebration with his parishioners at Ss. Columba-Brigid are Saturday and Sunday, August 26 and 27, 2017. Anyone who wishes to send Fr. Roy Herberger a note, please address them to him at 75 Hickory Street, Buffalo, NY 14204. Wedding Anniversary Mass ~ Any couple celebrating a 50th, 60th or 70th Wedding Anniversary during 2017 is invited to participate in a special Mass to be celebrated on Sunday, October 15, 2017 by Bishop Richard J. Malone, at 3pm at St. Joseph Cathedral located in downtown Buffalo. Following the Mass, an informal reception will be held at the Adam’s Mark Hotel. Family members are also encouraged to attend. A special certificate will be signed by Bishop Malone to honor the occasion, even for those who are unable to come out to attend the ceremony. For further information, please contact Catherine Kwiatkowski at 716-847-2210 or email ckwiatkowski [at] buffalodiocese [dot] org. Seating is limited. You may also place your name on the list by calling the our parish secretary, Pat Pendleton, at the church office as soon as possible..
Catholic Charities’ Chemical Dependency Treatment Program has immediate openings. The New York State licensed outpatient program aims to treat addiction with a combination of therapy and medicine. Visit ccwny.org/services/outpatient-clinic for more information and call central Intake at 716-895-1033 to begin referral process. Annual St. Lawrence Feast Day Celebration is Sunday, August 13 at St. Lawrence Parish (1520 East Delavan Ave., Buffalo). The celebration begins with a 12 noon Mass and continues with food and fun. Chiavetta’s chicken dinners, hamburgers, hot dogs, salads, and beverages will be available for purchase. 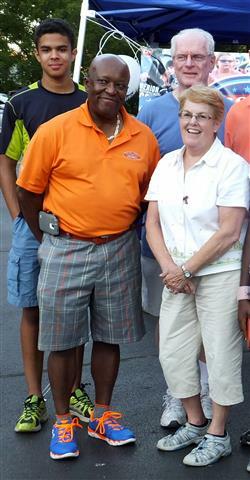 This event is one of two major annual fund-raising events. Tickets for a cash raffle are available upon request from the church ($2 each or 3 for $5). All proceeds go to pay for the new church roof. For more information, call the rectory at 716-892-2471. Music and Dance Under the Stars Sunday August 20 (7-9pm, $10 admisssion) at St. Joseph University Church (3269 Main in Buffalo) with Big Band Concert featuring the Jim Tudini Band with Bobby Militello. 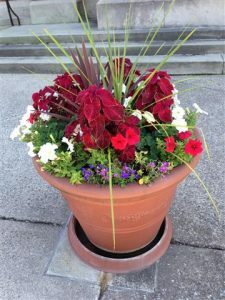 Tenth Annual Summer Arts & Crafts Show at Unitarian Universalist Church of Buffalo (695 Elmwood) is Saturday (10am – 6pm) and Sunday (11am – 5pm) August 26-27. This is also an opportunity to explore the English Country Gothic historic church from the early twentieth Century Arts and Crafts aesthetic. The NativityMiguel Middle School of Buffalo congratulates our newest graduates, the Class of 2017. We look forward to continuing our journey with them as they move on to high school next month. We are proud of their acceptances to such great schools as Buffalo Seminary, Mount Mercy Academy​, St. Mary’s High School, Buffalo Academy of the Sacred Heart, Health Sciences Charter School, St. Joseph’s Collegiate Institute​, Canisius High School​, Bishop Timon – St. Jude High School​, Western New York Maritime Charter School, and Tapestry High School​. Thank you to everyone who provided our students with their help and support!